Fabiana Perera is a Ph.D. student in the Department of Political Science at The George Washington University. 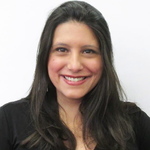 Fabiana is also an Honorary Teaching Fellow and Teaching Coach at The Global Language Network and served on the board of the alumni association of the Hispanic Association of Colleges and Universities for six years. Fabiana has an MA in Latin American studies from Georgetown University where she was a fellow in languages and area studies. Fabiana was born in New Jersey and raised in Caracas, Venezuela.